Charlotte holds a first class BSc (Hons) in Ergonomics (Human Factors Design) and a Diploma in Professional Studies from Loughborough University. 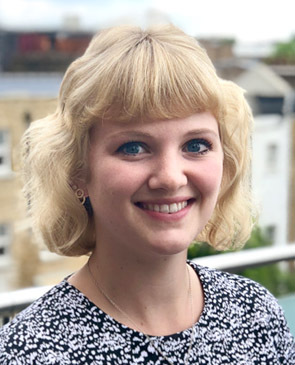 She is currently working towards chartered status as a graduate member of the Chartered Institute of Ergonomics and Human Factors (CIEHF) and is also a User Experience Professionals Association (UXPA) associate member. Before joining System Concepts in 2018 Charlotte was working within the rail industry, applying her research skills and human factors expertise to improve safety and standards across the industry. Charlotte started her career with the Noise and Vibration Division of the RAF and was responsible for risk assessing the noise and vibration exposure of personnel. Her experience working closely with users has enabled her to develop a rounded understanding of human behaviour across a diverse range of tasks and environments. Charlotte enjoys working in new areas, she adapts and applies her knowledge of user behaviour to analyse interactions and offer valuable insights to improve the safety and efficiency of products and services. User experience research methods: running creative workshops and focus groups, completing in-depth one-to-one interviews remotely and face-to-face, carrying out observations and assessments in the lab and in the field. Industrial ergonomics: measurement, assessment and expert human factors guidance in industrial settings, particularly within the rail industry. Office ergonomics: display screen equipment assessment, workstation design, musculoskeletal disorder risk assessment and space planning.